I have had more than several students go from "F" and when I say "F" I mean 30's and 40's to getting 100%. No problem. Once you understand some basic concepts all they can do is change the numbers. On the next page you will find hours of videos that will make those concepts plain, simple and EZ to understand...and once you understand the concepts, a little basic algebra and can do the computation required, it is easy and fun. This Page ALONE Is Worth The Price Of A Lifetime Password. I charge $50.00, for tutoring. The videos on the password protected page the follows are actual the lessons. Here is an introduction and a look at what's on the trig page...it's an excerpt from the actual lesson I gave that earned this student a 100% on his trig test. Prior to this he hadn't been doing well...to put it mildly. Even just understanding sin30° = 1/2 not just .5 can be huge for some students. But wait...1/2 = .5 you say. Of course it does but you may have lost the basic concept that that is a relationship of one to two not just "point five." It the relationship of the opposite side of the thirty degree angle to the hypotenuse. Later we will see how that relationship changes as the angle changes...but first we get comfortable with the special triangles...then we can put those special triangles on the unit circle which is supposed to organize thought and make studying these changes and relationships easier, not harder. This is explained in great detail on the videos you get on the other side. BTW, he did get a 100% on the next one too, we just never got around to making another video...and it took WEEKS to get the vid back from him...he did a nice job editing it though, I think you will agree. Here is a little short BONUS video that I have been told turned on a light bulb for an older student...a teenage girl who was "freaked out" about trig. 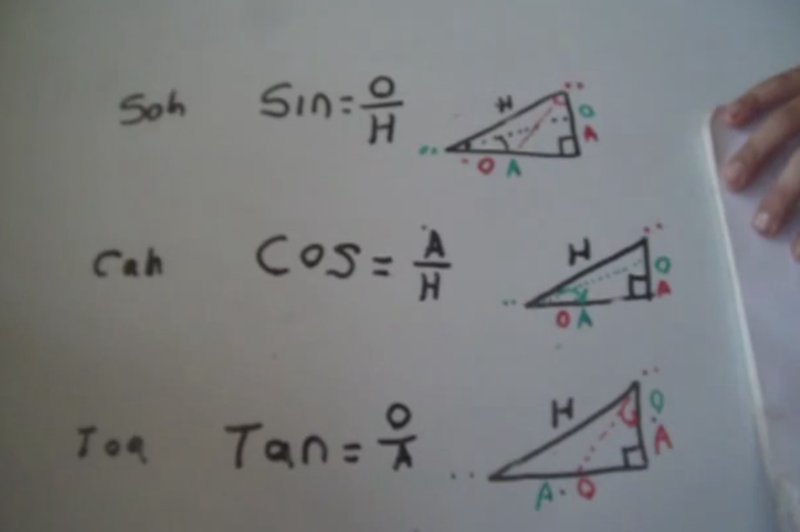 It's just a very simple explanation of the first three basic trig functions and their definitions. Thrown into a lesson with little boys...nothing hard about it. sinθ = 1/2 ∴ cosθ = x/2 should be no problem...and tanθ = y/x solving for x and y is crackers...nothing to it. EZ. This video alone is worth 50 bucks. A quick look at what's on the Trig Pages. Check out How to teach it to an 8 year old.